Nigeria saw the launch of Food Revolution Day on Friday, 20th May 2016 amidst a fanfare of celebrities, live cooking events, a flurry of social media activity and, of course, British celebrity chef and campaigner Jamie Oliver, who launched the campaign. 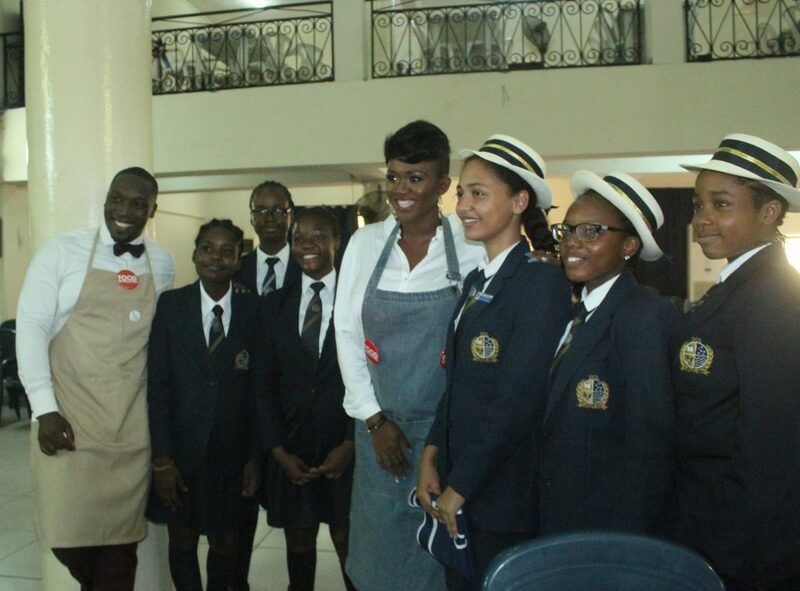 In Nigeria, the campaign’s Global Champions – singer, songwriter and philanthropist, Waje and leading cookery personally Chef Eros – were the hosts of the live event on Facebook which took place at Dowen College in Lagos at 2:30 pm. Reaching over 3 million people, over 127, 000 viewers tuned in to witness the broadcast which took place on Waje’s Facebook page. Now in its fifth year, highlights included chefs and celebrities streaming live on Facebook on 20th May during a seven-hour cooking marathon, calling for people around the world to sign up to the Food Revolution. Jamie was joined by a host of well-known chefs and personalities, all of whom carried out Facebook Live broadcasts from the around the world to help make history. Some of the notable names included Kris Jenner, Wolfgang Puck and Cody Simpson (L.A. USA); Chef Donna Hay (Sydney, Australia); Chef Ali and Juliani (Nairobi, Kenya); Chef Tim Malzer, Chef Steffen Henssler and Janina Uhse (Hamburg, Germany); Chef Ana Luiza Trajano and Chef David Hertz with guests Marina Person and Felipe Solari (Sao Paulo, Brazil); cookery personality Marion Elias and AliKiba (Dar-es-Salaam, Tanzania); Chef Eros and Waje (Lagos, Nigeria); Chef Lynn Crawford (Toronto, Canada); and Bart Van Olphen and Miljuschka Witzenhausen (Netherlands). Food Revolution Day was also supported on social media by Coldplay, James Corden, Kate Hudson, Nicole Scherzinger, Davido, Rio Ferdinand, Paloma Faith, Niall, Zoella, Jim, Tanya, Louis, Pixi Woos, Haste Kicthen, Olly Murs, Ronan Keating, Marlon Roudette, Cascada, Cornelia Pletto, Palina Rojinski, Holger Stromberg, Chris Mears, Naomie Harris, Jake Paul, Emmanuelle Chriqui and Keltie Knight. The aim of Food Revolution Day was to encourage people to join them in a full-scale, global Food Revolution – a major part of which will be giving people power to lobby their own governments to fight diet-related disease. It aims to provoke discussion and inspire positive, meaningful change in the way we access, consume and understand food. Starting in kitchens at home and moving up to the highest levels of business and government, Jamie believes people must work together to empower children with the nutritional knowledge and resources they need to live healthier, happier lives. Currently 41 million children under five are overweight while another 159 million are too undernourished to grow properly: we are in the middle of a global health crisis. In Nigeria, the government has achieved some key milestones in tackling the child nutrition crisis, like the 2005 universal iodization of salt. Programmes like the ‘Saving One Million Lives Initiative’, which placed nutrition as a core focus, are positive but still much more needs to be done. As the country now faces both an obesity epidemic, with 13 per cent of boys and 12 per cent of girls under the age of 20 being classed as overweight and obese in 2013*, and a severe number of undernourished children, the government needs to step up its efforts in tackling the crisis. Jamie Oliver and thousands of others across the globe are asking for people to call on their governments to commit to action on nutrition and sign up to the Food Revolution (www.jamiesfoodrevolution.org) and use #foodrevolution in social media posts to show global leaders that this is an issue that can’t be ignored.